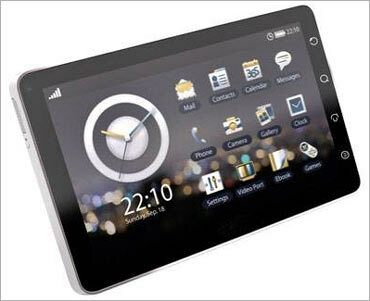 Rediff.com » Business » India's first 3G tablet is here! India's first 3G tablet is here! Olive Telecom, a convergence solutions device developer, announced on Thursday the launch of OlivePad -- VT100, India's first 3.5G tablet. The device was unveiled in New Delhi by Arun Khanna, chairman, Olive Telecom, David Hind, chief executive officer, Olive Telecom, Americas and Artem Orange, CEO, Olive Telecom. 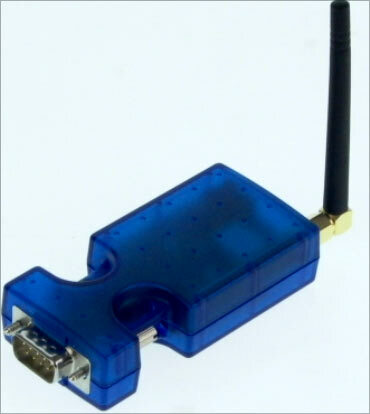 Designed as a multi functional device, Olive Pad operates on an Android Operating System and supports 3.5G High-Speed Uplink Packet Access, Wi-fi, and Bluetooth. 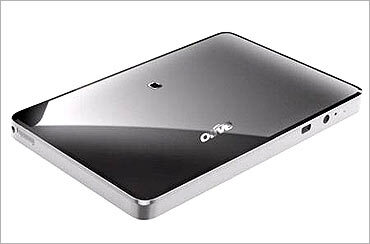 The OlivePAD is priced between Rs 22,000 and Rs 25,000. It comes with a 32GB memory card. With an inbuilt 3 mega pixel camera and a front camera, the Olive Pad can be used as a touch notebook. It allows browsing, multimedia, instant messaging and social networking, global positioning system for maps and turn by turn directions, gaming console, an e- book reader, television. It also doubles up as a smart phone allowing voice and video calling. OlivePad is equipped with distinctive features which include flash support, mini USB port, camera and a smartphone. The OlivePad will be available countrywide at all Croma stores from August. The new Olive Convergence portfolio is complete with wideband code division multiple access, code division multiple access, GSM and evolution-data optimised handsets and smart-phones, mobile computing devices and advanced data modems for wireless broadband.